It’s been tough getting motivated to train over the last few weeks. My heart has just not been in it and with the holidays there is plenty to keep me doing other things than hitting the gym on a regular basis. One thing that motivated me two weekends ago was a fellow Daily Mile member who had asked for anyone who could run to go out for a mile or two since he was injured and “on the bench.” That day I managed to go outside and run an easy 5K. Last weekend I managed a nice 10+ mile run at the gym. The miles were easy as I watched ESPN on the treadmill. This was a confidence booster as I hadn’t ran over 5 miles in several weeks. The next day I felt great with zero soreness giving testament to my enduring fitness level even though I had been taking it easy with only 1-2 workouts a week. Goes to show you that fitness does go away, but it doesn’t go away overnight. This also reinforces that it’s okay to take some time off and cut back as long as it doesn’t turn into six months of doing nothing. I was hitting the gym 1-2 times per week getting a lot of extra sleep and recouping physically, mentally, and motivationally. Now it’s go time as I have a full marathon at Walt Disney World in 45 days! Last Sunday I did my 10 miler. Monday I hit the elliptical and some light weight lifting. Tuesday I did some speed work on the treadmill with twelve 400m repeats. Today I duplicated Monday’s workout. So I feel like I’m back on track, but with that being said I’d like to lend some advice on getting back on track to finding your motivation again when it gets lost in the woods. Just like when you first started being more active if you’ve been away for two weeks or two months don’t try to pick back up exactly where you left off. Go for a walk, a short run, ride a bike in front of the TV, play a sport you love, or walk your dog, but just get active again! Someone you know likes to run, bike, swim, lift weights or play badminton. If you don’t have someone personally close to you then go out to Facebook, the daily mile, or the plethora of other websites and just watch those people go! Many are willing to send you an “atta-boy OR atta-girl” for being active. You can be your own worst enemy so quit thinking and start doing. Don’t sit there and talk to yourself about how busy you are for next 10 minutes. Instead use that 10 minutes to be active! A 10 minute walk is activity! Find some motivation by posting what you did on a website or start your own blog. If not then just tell the first person you see who asks, “How are you today?” The response, “I’m good! I hit the gym this morning.” If you have a specific goal tell them about that too. Nothing motivates you more than knowing that everyone knows, you know? Find something far enough in the future that you can train for it, but close enough that you need to start now. Looking forward to a half marathon a year from now means you could slack for six months and still do it. Registering for a 10K six weeks from now means you need to get going now! Put it on your calendar at work to remind you daily about your goal. Add an update to your mobile phone. Write a note and put it on the fridge! You don’t have to do the same workout, but just being accountable to someone else that you’ll show up at the gym does wonders. You can’t let ’em down! Subscribe to Men’s Health, Runner’s World, or some other fitness oriented magazine. Reading about exercise will keep it on your mind and perhaps motivate you to try new things. You can also go to Amazon.com and find some great books on running or just about any other sport or form of exercise. Go for those inspiring stories that make you want to run out the door at 3am for a 10K run! No extra cash to buy these things? No problem. Follow a few more fitness bloggers for free or “Like” a magazine on Facebook. Those sites put up free content all of the time! If you are returning and have a goal then write down a training plan even if it’s a simple one. Even if it’s a one week plan that you are going to repeat for the next four weeks that’s okay. Just get it down on paper. And remember, write it in pencil. Who knows, you may run an extra couple miles and need to edit! When you hear those voices you should instantly say something positive. “I’m awake so I’m getting up.” or “I’m going to DVR American Idol, problem solved.” or “I am amazing!” Positive self talk is a method used by both amateur and professional athletes so why not use it yourself. Telling yourself, “I can do this!” is a great way to prove yourself right! That’s it! 10 ways to stay motivated or get re-motivated. If you are state side I hope you had a great Thanksgiving. If you see me at Disney in January be sure to say, Hi! New Disney Marathon Course for 2013! Ok, so there I was sitting at my desk and an email hits my inbox from a friend of mine who is a fellow “runner of the world”. 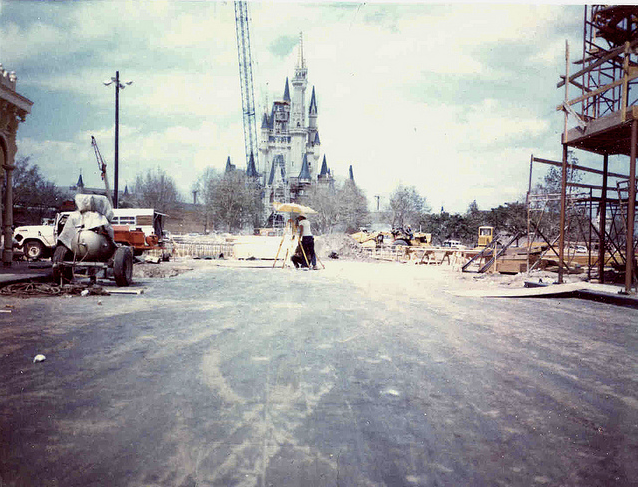 The subject line of the email…”new wdw marathon course!” Really? I mean REALLY?!?!!? First, it’s the 20th anniversary of the Disney marathon and now runDisney tempts us with a new course as well??? Oh, come on! Sorry….my fit is over now. See the video of the new course! And here’s the 2013 map! A couple of cool additions to the marathon course AND a 20th anniversary medal! The 2012 Goofy Challenge is over and I am happy to say I arrived on the other side of 39.3 miles (+3.1) unscathed! Kate and I arrived at Disney World on Thursday this year and went straight to the Expo after dropping by the hotel to see if our room was ready (it wasn’t). We stayed at the Hilton Grand Vacation near the Vineland Premium Outlets just a 5 minute drive from Disney property. Why stay off property you ask? Two words…Jacuzzi Tub, but more on that later! While at the Expo I picked up a new wardrobe of running shirts as each of the three races came with a shirt and I also purchased Goofy Challenge memorabilia and two coast-to-coast challenge shirts as I’m doing the Disneyland Half Marathon in September. Be sure to register on January 18th, 2012 if you missed the registration at the Expo! One of the best things about the Expo was getting to meet a long time twitter follower, Facebook friend, and Disney Mom’s Panelist…Deborah Bowen also known as @DisneyDeborah on Twitter! I met Deborah for the first time Thursday! Deborah after crossing the Marathon finish line! 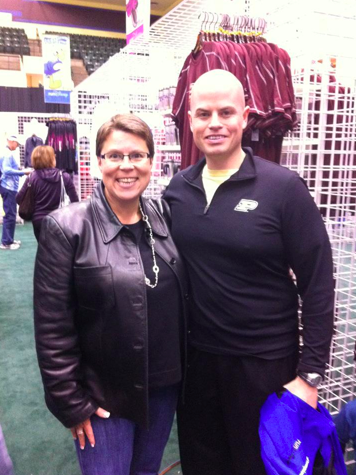 Deborah is not only a fantastic person and friend, but also completed her first full marathon on Sunday! So proud of her! It’s that time in my training to start the tapering process and I couldn’t be happier. The Monumental Marathon in early November did something to my left knee so I’ve been babying it ever since. I actually started last week (1 week early) due to the knee. I finished up my last long run of 20 miles a couple weekends ago and then ran the Jingle Bell Run last weekend. Today I ran my first 4 miles with zero pain, twinges or other knee maladies! Woo! Still I have a short 10-12 miler this weekend and I’m hoping between my rehab efforts and my knee brace I will get thru just fine. I also switched back to an older pair of shoes I had that seemed to help a bit. In other news I am working out in the mornings again for a few weeks and have even done a couple two-a-day workouts to get a little more weight lifting and easy cardio in for the holiday season. My wife and my mother are both excellent cooks so I have to burn some extra calories somewhere! 🙂 Christmas is the time to go ahead and have that slice of pumpkin pie or a few more slices of turkey…just run an extra mile or two to make up for the splurge! My next post will be all about packing for the trip down to Disney World. I’ll need a bit of equipment to get thru 42.4 miles! It has come to my attention from one of my readers (Thanks Jenn!!) that runDisney has yet to post Jeff Galloway’s updated training program for the 2012 Goofy Challenge. Being a training program connoisseur of sorts I downloaded it back when it was still posted in 2010. Thinking back I guess I already knew that runDisney had taken the old training program down since I had emailed them about the dates being “off”. The dates were off since it hadn’t been updated since 2009 when it was originally published, but the basics were there. Now remember race fans, this program is designed to get you across both finish lines in the upright position not set land speed records at Disney World. It’s a fairly simple program that follows Jeff’s run/walk philosophy. Most weeks you only run 3 days and rest/recovery is a key component of the program. Seeing how I don’t have express written consent by the Walt Disney Company or Jeff Galloway to republish the PDF I have (assuming I can find it…) I will talk in generalities and answer questions if you have any. Don’t worry though, there’s a table below with a week by week schedule. You know you want it...or one very similar to it! The program is around 30 weeks in length. I’m sure once runDisney updates it the numbers may not be exactly the same. For my own use, I adapted the program a little to fit my own needs, but the basis of the plan is here. Also, I believe it is suggested that you have been running for 6 months prior to starting this Goofy Training Program. If not, take it easy and follow the plan as prescribed by runDisney. As always, you should consult a licensed medical professional (aka: a doctor/physician) before beginning any exercise program. Especially, if like me you are a middle aged guy with a Peter Pan-esque view on life! Hopefully, I spelled out the fact that you are at risk in this 39.3 mile undertaking and that you’re making the decision on your own to do this training program or participate in it in any way either in full or in part…..heck people, GOOFY is the mascot! There’s a little bit of crazy going on to try something like this and I’m doing the 5K too so that makes me just plain Dopey! Okay, enough of the legal speak about it being YOUR decision and YOUR own liability should something bad happen to you. You have been warned!! On to the training program! Like I said, this program is fairly simple. I’m not going to get into the whole run/walk method because that is Jeff Galloway’s thing. There is also a training tool Jeff suggests called a “Magic Mile” which he has you do every so often to see how you’re progressing. I’m a runner and plan to run 85-90% of both races not including the time it takes to stop for pictures. Oh yes, there will be lots of pictures! Again, see my blog post about the WDW full-marathon last January 2011. So here it is…in general…the 30-ish week Goofy Challenge Training Program as best as I can remember it. By the way, if you actually followed this program then you would start in mid-June. 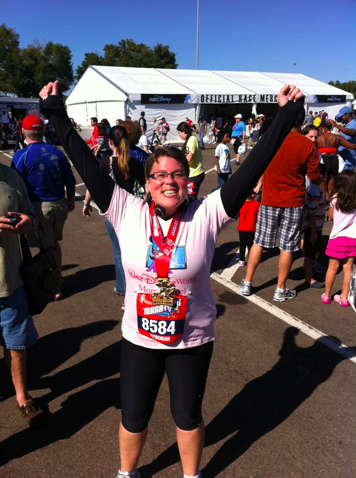 The program takes you a couple weeks PAST the WDW full-marathon on Sunday January 8th, 2012 for recovery purposes. Tuesdays and Thursdays are 30-45 minute run/walks according to the original program. Go to Jeff Galloway’s Website for details on the run/walk method. You’ll notice that you get six weeks of training before you have your first weekend of back-to-back workouts. I also took the liberty of switching the run days for Christmas and New Year’s Day to Saturday, but feel free to run when you want! Oh, and don’t forget to plan for holidays (in no particular order) like July 4th, Thanksgiving, Hanukkah, Labor Day, Father’s Day, President’s Day, Ramadan, Boxing Day, Administrative Assistant’s Day, Yom Kippur, My Birthday (Oct. 7th), etc. Of course, you may opt to throw in some cross training for some of those rest days. I would suggest taking a rest day before and after those weekends where you’re doing a long walk followed by a long run the next day. Your body (muscles, ligaments, joints, etc) need the rest even if you’re not tired. You may also want to do specific types of runs for the “30-45 min” runs on Tuesday and Thursday. I do intervals and Tempo runs on those days…usually a little longer than 30-45 minutes. I also add in a little lifting on some days usually twice a week with my cross training. All that stands between you and these three medals (besides common sense) is the proper training program! Let me know if you have any questions and happy training! I must be crazy errr…or Goofy in this case. For all my running endeavors this past year I’ve been called crazy, insane, over zealous, “special” and been asked,”Whyyyy?” as people give me that side ways look that running this much just isn’t quite right. After all I’ve logged four 5Ks, four half-marathons, a 4.5 mile drumstick dash and one full-marathon (see my schedule) in my 2010 season as a newbie runner. So what more is there? 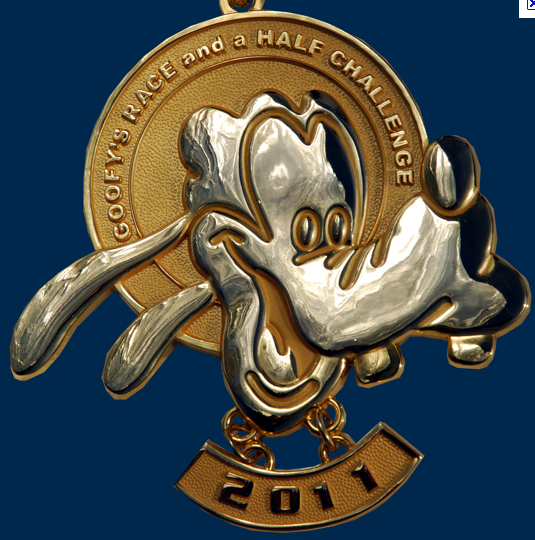 Well come January 2012 I will be just plain Goofy….as in Goofy’s Race and a Half Challenge at Walt Disney World in Orlando, FL! Garsh! First, arrive in sunny (hopefully) Orlando, FL. Second, travel to Disney World. Third, run the Disney Half-Marathon on Saturday morning. Next, wake up Sunday and double Saturday’s distance by running the Disney Full-Marathon. The prize? 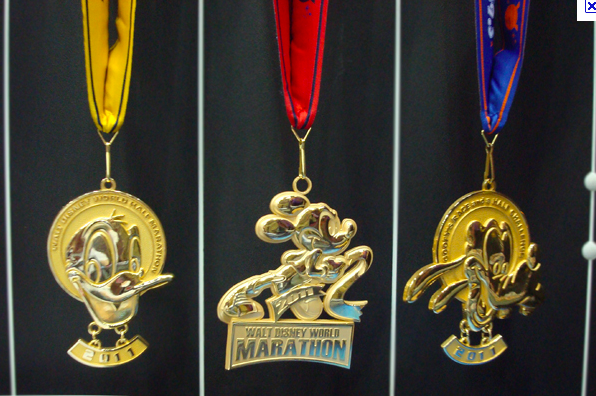 Not one, not TWO, BUT THREE count ’em T-H-R-E-E, three medals….Mickey, Donald & finally Goofy. Holy Cow!!! Or Holy Mouse, Duck and Dog in this case!! Now that is a lot of bling for two days of Disney fun! So how does one train for something like this!?!? As luck would have it, Disney’s got you covered for this too! Former Olympian, world renown running coach and author, Jeff Galloway, has free training schedules (yep F-R-E-E, free) available for anyone on the runDisney.com website. There are separate training schedules for the half-marathon, full-marathon and Goofy Challenge…and a few other races at WDW as well! The Goofy Challenge training schedule is a 28 week program and it is suggested that you’ve been running for six months prior to starting this program. I will finish my third half-marathon of 2011 on June 11th just a few weeks before I should start the 28 week program for the Goofy Challenge. I’m excited to start training for it! I used a Jeff Galloway program for the last half of my full-marathon training last year and had no trouble finishing my 1st full-marathon. The major difference I see between a regular marathon training program and the Goofy Challenge training are back-to-back “long days” 6-8 weeks into the program. There are weekends where I will have a long run on Saturday followed by a long walk on Sunday. This prepares your body for two days of longer endurance bouts. I like Jeff’s training program because unlike traditional running programs his training stresses the idea of recovery as a key component in training. Similar to a traditional program Jeff’s program builds distance for 2-3 weeks and then there is an “easy” week to give your body time to adapt before building again. The difference for example is that Jeff’s recovery week includes just a 3 mile weekend run after a 15 miler the previous week where a more traditional program might just drop back to 10 miles for the “easy” week. Jeff’s program really allows for more rest and recovery. This program also allows for you to have a weekend where you aren’t running all morning on Saturday! I might even be able to sleep in a little! Like last year I will be running with the WDW Radio Running Team which raises money for the Make a Wish Foundation. We were able to raise enough money to grant a wish last year. Hopefully, we will do the same this coming January! So, will you join me for The Goofy Challenge? How about the Half-Marathon or just the Full-Marathon? I’d love some company!